« Another ZJM amplifier in our workshop. 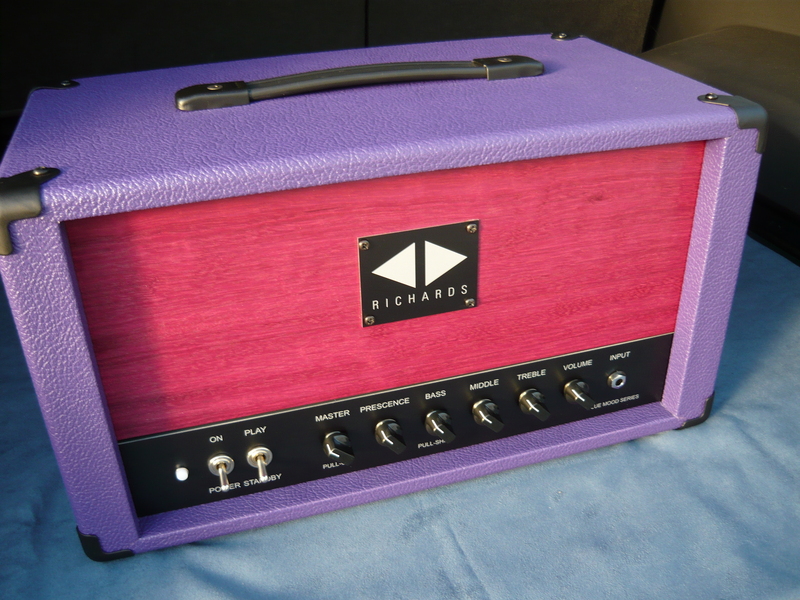 Here is a new model in the Blue Mood series of amps from the Richards Amplifier Company – Australia. Utilising our smaller chassis size, and powered by a pair of 6V6 output valves, the Blue Mood amp is now available as a 12W head. In spite of the seemingly rather modest power rating, this amp is quite capable of holding its own with a bass player and drummer. 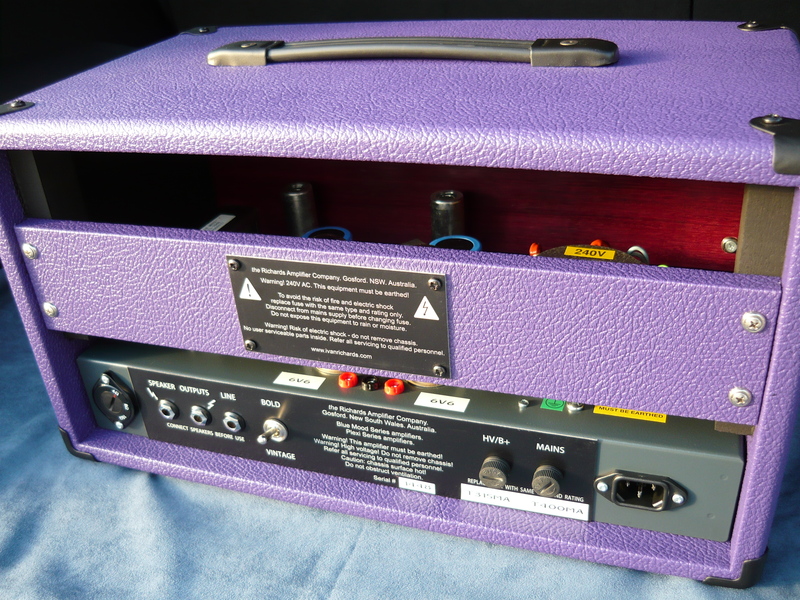 This example is presented in a stunning combination of colours – vintage style (British) purple tolex, and a front panel made from a selected piece of exotic hardwood – purpleheart. Black hardware, control panels and control knobs complete the picture. 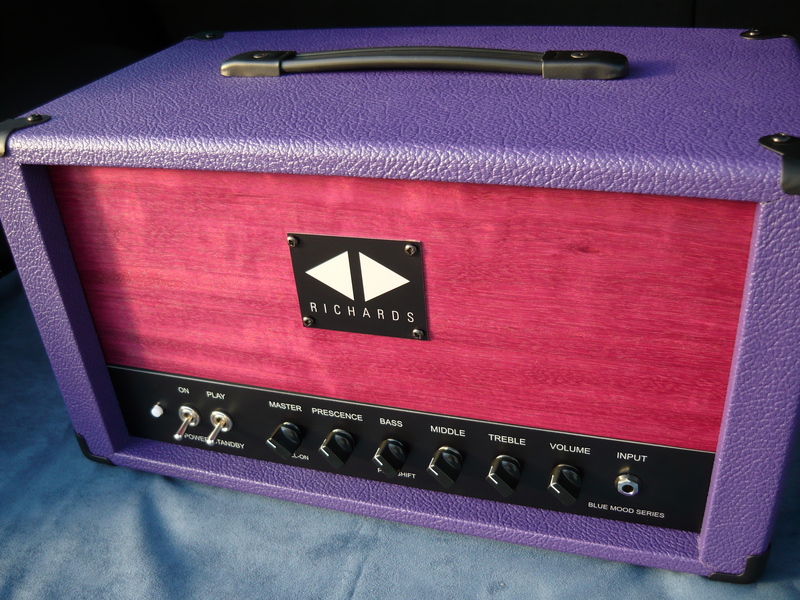 Those of you who are familiar with our amplifiers will know that we are particularly proud of the presentation of our amps in such beautiful timbers as Tassie Blackwood, Bird’s Eye Maple, Bubinga, and others – now including Purpleheart. The basic Blue Mood format offers a stripped down circuit for purest signal path. A single high impedance input jack, volume control, passive treble/middle/bass controls, active prescence control, and master volume control with bypass. The bass control has a pull-shift function to shift the focus of the bass and midrange controls upwards by approx 1 octave, for an alternate vintage voicing. 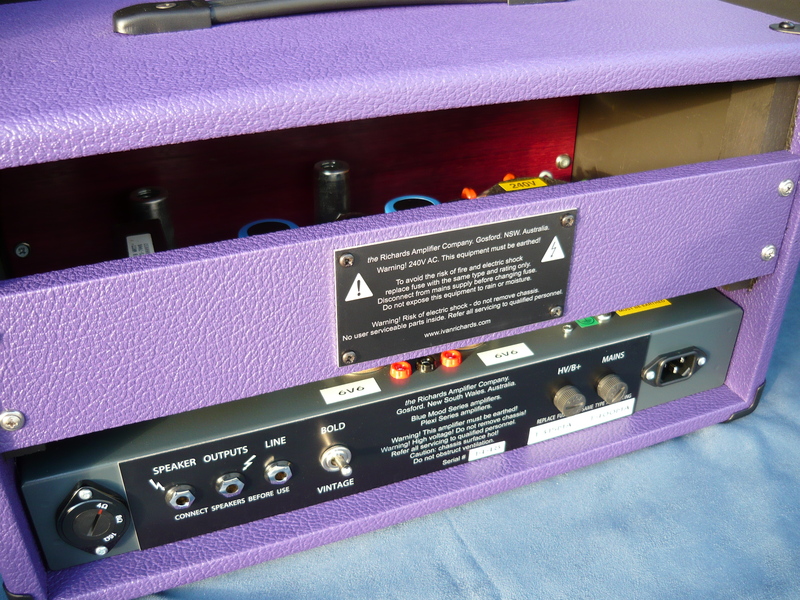 Rear panel offers 4/8/16 ohms impedance selection, a pair of parallel-wired speaker jacks, line/DI jack, a pair of fuses, detachable mains connection, plus a bold/vintage switch – in this amp the vintage setting reconfigures the 6V6 output valves for class-A/cathode-bias operation. The basic tonality of the Blue Mood amp is inspired by everybody’s favourite early 1960’s amp from California, as exemplified by the Mark Knopfler’s, Stevie Ray’s and the Brian Setzer’s of the guitar world. We just go out of our way to make it a little fatter, a little warmer, and a little sweeter. Each and every amplifier is individually hand-assembled, hand-wired, one at a time, by one person from beginning to end, to a specific customer order. This entry was posted on September 4, 2012 at 11:12 am and is filed under Amps, Friends of Ivan Richards Audio. You can follow any responses to this entry through the RSS 2.0 feed. You can leave a response, or trackback from your own site.